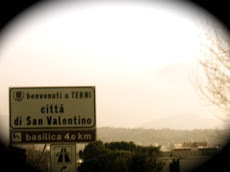 Toronto to Terni: La Dolce Vita Series: Pranzo! Mondays are usually dreadful coming into work in the morning. However, this Monday morning I'm already feeling inspired and excited by the food images in this week's Dolce Vita series --the prosciutto, the fresh produce, i dolci.....mmmmm! 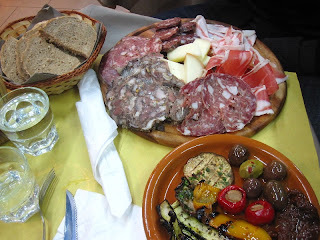 I am now remembering this amazing Tuscan lunch I had in Florence last year. As we were heading to Ponte Vecchio, my stomach told me to stop in my tracks and said "Pranziamo!" -Let's have lunch! (Well, it came out more like a big and loud grumble). I spotted this cute little deli across the street and suggested we check it out. My boyfriend responded, "Tesoro, I don't think they have tables. I don't think we can eat inside". As stubborn as I am, I said "Who cares, let's check it out anyways!". So we crossed the street, and as we approached the window......I couldn't help but have the "I told ya so" look on my face as I watched him acknowledge there were about 4 wodden tables and chairs in the back of the deli. All I gotta say is, thank God we stopped. When we got inside, I was like a kid in a candy shop! 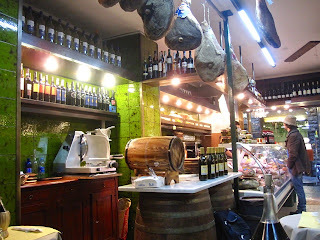 We finally selected a variety of cured meats and antipasti served with a generous amount of fresh bread. We grabbed a table in the tiny back area where there were some local Florentines enjoying their lunch (How did I know they were local? My boyfriend could tell by the way they spoke apparently). Mmmmm. It was the best lunch I had while I was in Florence, and super inexpensive. I only wish I could remember the name of the place. I'll have to hunt it down when I'm back in September. 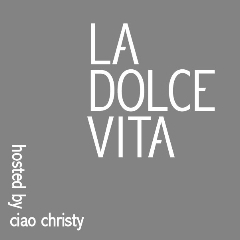 Hi there I am calling by as another participant in Ciao Christy's - La Dolce Vita. I am sure you must be really excited about your imminent move to Italy, wishing you all the best. Thank you Lindy! I am very excited and nervous. I have been preparing all summer, yet I still feel like I will never fully be prepared. I love all the beautiful photos in your blog. What a wonderful garden! My mom would fall in love!